AuthorMitaliPerkins: Is this a Job or a Vacation? Is this a Job or a Vacation? Start with lunch at the high school library, where you and a few teenagers feast on the librarian's homemade meatballs, cheese, crackers, fruit, and spritzer water. The students inform you that most of their parents also went to their high school, and that many adults commute into Boston up to two hours each way just to stay in town. Watch over a hundred high-schoolers stream in for your session. The poised, handsome sophomore guy who will introduce you tells you the school is mostly white. Some of the Cape communities are more diverse, he adds, with a Wampanoag community in neighboring Mashpee and an increasingly international population in Hyannis. You're impressed that he knows, and humbled by the work he's put into a two-page introduction to your work and life that he delivers flawlessly. Students have been primed for your visit by reading your book. Their English teacher has created such a wonderful lesson plan that you ask for permission to share it with other educators via your website (to be added). As a result, his students are engaged and ready to ask thoughtful questions. Smiling benevolently in the back of the room is member of the Sandwich Reads Together committee (responsible for luring Jodi Picoult, Geraldine Brooks, Allen Say, Anita Silvey, and Alice Hoffman to participate in their month-long festival). Also watching is the bookstore owner who invited you in the first place, the principal, and a few other teachers and parents. 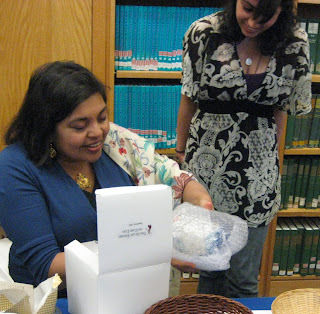 When you're done, the librarian raffles off a few of your books and you personalize them. A lovely girl whose parents were born in Pakistan presents you a piece of glass hand-blown in Sandwich's famous Cape Cod Glass Studio. She quietly tells you how much it meant to her that you visited, and you try to hide that you're getting choked up. Now you have two hours of free time to wander the town before your book signing. What do you do? You pop into the historic Daniel Webster Inn for a tour of the spa (luxurious but too steep for your writer's budget). Heading to a small (cheap) beauty salon instead, you wait for a hair cut and listen to an eighty-something widow explaining why she loves living in Sandwich. Drive to the town beach next, put on your coat, and walk to the edge of the water, passing an elderly couple strolling hand-in-hand. The sun is sparkling on the waves and seagulls screech at the fish. 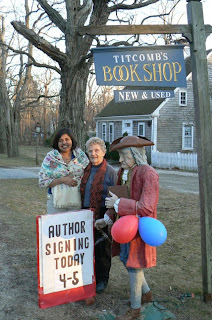 Next stop is your signing at Titcomb's Bookshop. The owner, a curator of charm, makes you feel like a visiting dignitary. She's baked Indian biscuits and Bollywood music wafts through the sunlit oak interior. You meet the owner's youngest sister, who also works there, and their parents, who started the shop years ago. A customer tells you how much she loved your novel. It made her cry, she says, just like Gone With The Wind. She describes a childhood on one of the first blueberry farms in Cape Cod, just down the street, and then confesses that she's taught herself to read and write Arabic in recent years. The elegant Mrs. Titcomb (pictured) gives you a tour of her adjoining home, built in the early seventeenth century, and you admire the family tree she's painted on the wall to display her 21 grandchildren. You climb the wooden staircase, made by two of the Titcomb brothers, and discover Mr. Titcomb working with the rare books. He tells you his wife was mistaken. They've been married for 58 years, not 56. Last stop is the Sandwich Public Library, where the librarian has planned a feast with Trader Joe's Indian food and invited twenty or so sets of mothers and daughters who have read your books. The tables are decorated with Sweet Tarts because the librarian discovered on-line that they were your favorite candy. You gain more insight into community life over dinner conversations, sign books, answer questions, and leave laden again with gifts -- books about walks and seaweed in Cape Cod, a Titcomb's bookshop pen, homemade honey, and a bracelet made in Bengal, your native land. After eight hours in town, you feel as if you've been on holiday visiting friends in Sandwich for a week. Another perk of the job, you realize. What a vocation.